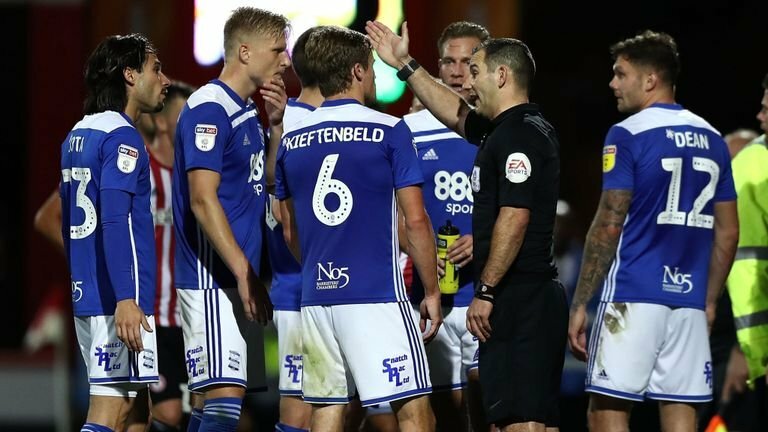 Birmingham City’s appeal against the sending off of Maikel Kieftenbeld has been successful and the FA have rescinded the red card given to the Dutch midfielder in Blues’ 1-1 draw with Brentford on Tuesday night. Kieftenbeld was sent-off controversially for an off-the-ball incident involving Brentford striker Neal Maupay. The incident was brought to referee Tim Robinson’s attention by the fourth official, who instructed Robinson to send Kieftenbeld off. The decision was one that incensed Blues boss Garry Monk, who was sent off from the dugout due to his protests and has since been charged by the FA for his actions. An Independent Regulatory Commission has viewed video evidence submitted by Blues and have ruled that Kieftenbeld’s dismissal was given wrongfully. As a result, Kieftenbeld will not have to serve a three-match suspension he would have done, had the red card appeal have been unsuccessful. This means the midfielder will be available for Blues’ home fixture against Rotherham United on Saturday.